"Danger won't stop him. Nature won't break him". Join Archie Nesbitt in his hunting adventures by visiting this website for more world records; more explosive action and exotic locales, as the acclaimed bow hunter travels the world in search of the ultimate shot. Although Archie has attained near legendary status in the world of bow hunting, he remains humble and passionate not only about the sport he pursues but about protecting what he considers the world's most precious of renewable resources – wildlife. "My travels aren't just about hunting. As a life-long hunter, I believe it's my duty to open the world's eyes and inform people about conservation efforts geared towards preservation of the world's hunted wildlife. By protecting wildlife and their habitats we not allow for sustainable animal populations, but we preserve the ancient tradition of hunting and its primary function of feeding local human populations throughout the world." 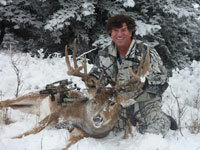 Archie Nesbitt Productions has a collection of hunting adventures from around the world. Join one man -- Archie Nesbitt -- as he travels the world in search of the next ultimate shot. Follow Archie on Facebook and Youtube. Get the latest updates and news.